North Korea says it has succeeded in launching a long-range rocket and placing a satellite into orbit, provoking stern condemnations from governments across the globe. 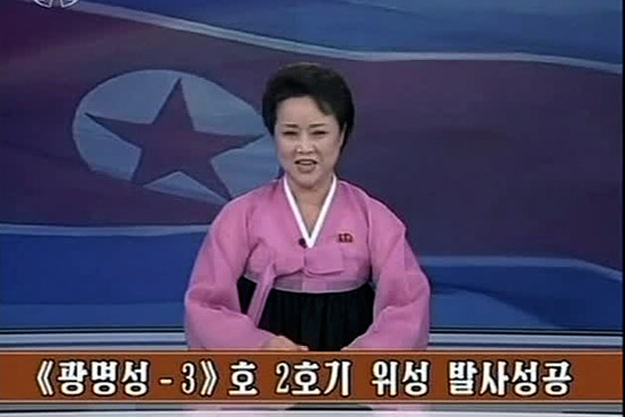 The official Korean Central News Agency reported the news early Wednesday and it was later announced triumphantly by an anchor on North Korean state television. "The second version of satellite Kwangmyongsong-3 successfully lifted off from the Sohae Space Center in Cholsan County, North Pyongan Province by carrier rocket Unha-3 on December 12. The satellite entered its present orbit." The North American Aerospace Defense Command says initial indications suggest the launch was successful in placing an "object" into orbit. If confirmed, observers say it would represent a major step forward in North Korea's quest to develop an intercontinental ballistic missile capable of carrying a nuclear warhead. North Korea insists the mission was aimed at placing a peaceful weather satellite into orbit. The launch triggered strong condemnation from the White House, which said the "highly provocative act" threatens regional security and violates U.N.Security Council resolutions banning ballistic missile activity by Pyongyang. U.N. Secretary-General Ban Ki-moon also deplored the launch as a "clear violation" of U.N. sanctions, saying he is concerned about its consequences on peace and stability in the region. Seoul's Foreign Minister Kim Sung-Hwan said Pyongyang will bear "grave responsibility" and face deeper isolation as a result of its actions. "North Korea ignored repeated warnings and demands by the international community that it should withdraw the rocket launch. Our government along with the international community strongly denounce it." Diplomats say the U.N. Security council is expected to meet Wednesday to discuss the launch at the request of Washington and Tokyo. Both South Korea and Japan also called emergency meetings of their top security councils. The launch came as a surprise to many observers, since reports just a day earlier suggested that North Korea was disassembling the rocket because of technical difficulties. David Fouse, an analyst with the Hawaii-based Asia-Pacific Center for Strategic Studies tells VOA that the notoriously reclusive leadership in Pyongyang may have intentionally misled the international community. "I'm not sure whether there was an intelligence failure or if the North Koreans were just kind of playing games with the international community. They might have wanted to catch people off-guard and I think they did surprise a lot of people with the timing of this launch." North Korea on Monday extended the deadline for the launch to December 29, after citing a "technical deficiency in the first stage control engine module of the rocket." Pyongyang is banned from carrying out any missile or nuclear-related tests by United Nations resolutions imposed in 2006 and 2009, after it conducted nuclear tests. A rocket launch in April ended in failure. The U.N. Security Council condemned the failed April launch and ordered foreign assets seized from several North Korean companies linked to financing and procuring weapons and missile technology. Weeks after that launch, the United States responded by canceling a deal that would have provided the impoverished North with 240,000 metric tons of food.